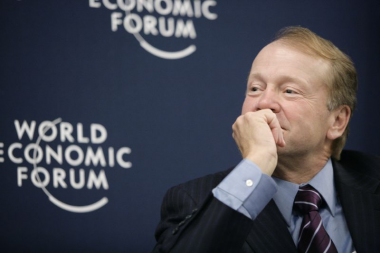 Shares of Cisco Systems are falling today by more than 1 percent, following a quarterly earnings report that was probably more good than bad, and cautiously optimistic comments from CEO John Chambers about the state of the economy and the markets in which Cisco participates. AllThingsD: John, you were just on CNBC a little while ago, talking about how some of your customers are seeing a slow start to 2013, but generally feeling positive. Your shares moved after-hours in reaction to that, and people tended to focus on that. Can you unpack what you meant? Chambers: I talked about a lot of positive things, and I think sometimes people will take one element and focus on it. When you have record earnings and record revenues, and you’ve done that for eight quarters in a row, the key takeaway about the quarter has to be that our vision and strategy is working. Many times — not entirely — but many times, we’re out-executing the vast majority of our peers. The second element is not that Cisco is off to a slow start in 2013, it’s more that 2013 is off to a slow start economically in terms of what our customers are saying to us. I believe, based on what they are telling us and based on our order trends, that it appears to be, barring government mis-execution in a big way, I think we can handle a short-term pause. But, barring a big economic surprise, it’s just going to be a slowly improving year. My customers are saying it’s looking like a better year than they’ve seen in a couple years, and the trend is up and to the right, but it is coming off a slow base. So I think we’ll see relatively slow GDP growth in the U.S.
That seems to be the sentiment right now. Yeah, most of my customers are saying they see a point and a half of GDP growth in the first half of the year, and unfortunately that means they’ll spend to that. On the other side, our enterprise and commercial accounts are showing two quarters in a row of really solid growth. And they’re usually a good indicator two to four quarters out. So would you say you’re expecting something of an acceleration later in the year? I would use a different phrase for it. I’d say cautious optimism. There are some very smart people who are very negative not just on Europe but on the U.S. So our eyes are wide open to the fact that we may be of the minority view. But we have the advantage of seeing our order patterns among our customers, and being able to talk to most of the government global business leaders around the world. What’s working and what’s not for Cisco right now? I think what’s working are the vision and the strategy of the role of the network, and beginning down the path of being the No. 1 IT player in the world. This quarter was another proof point of that, especially in the data center, but also in software. Secondly, what’s working is key technology trends, such as cloud and data center, mobility and video — all had very good quarters. What’s not working is that we’d like to see things growing faster on a global basis. Assuming we continue to be a reasonably good barometer of the global economy, we’d like to see these things growing a little faster. How do you feel about the competitive landscape? We love to compete, and we try to always compete with class. And we compete to win the market transitions. So let’s look at those. In the transition in the cloud and the data center, we’re challenging the incumbents that have been there for two decades. Let’s face it, servers are a commodity. And yet our servers get a dramatic premium, and they are tied very tightly to a switch. And we’re winning with a 65 percent growth rate in a market where our peers are flat or growing in low single digits. The second thing that is working is mobility. It was an Achilles’ heel about two or two and a half years ago. Now we’re the leader in most segments of mobility that have profits. So mobile edge, mobile backhaul, mobile packet edge, wireless LANs, small-cell, integrating it all together with wired capability. And collaboration tied to it, it really feels good to win there. The third thing would be in video. We’re making a pretty good transition from a set-top box where we’re making very little profit, and we’re starting to walk away from deals where people won’t pay for an architectural play; we just don’t bid on it. And, in spite of that, we’re up about 20 percent, mostly on software from NDS, so the market is going where we want it to go. It’s too early to say how far along we are in becoming the world’s No. 1 IT player, or the Internet of everything. I’d say a little bit of progress there, but it’s way too early in the ball game to say.